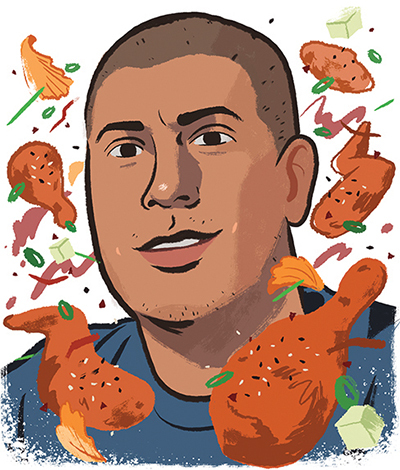 A former Boca chef, Pedro Rangel is calling the shots as cofounder of Findlay Market’s Seoul Hot Chicken pop-up—an instant success this past fall. He’s also working on a food hall concept adjacent to the market, slated to open in spring 2019. What do you like most about your new job? Exposing Cincinnati to Korean fried chicken that they’ve never had before, and seeing people’s excitement and reaction, because it’s something new for them. How does Korean fried chicken compare to others? Traditional American fried chicken is more of a dredge, usually out of a wet mixture—buttermilk or milk and eggs—before it goes into the seasoned flour and gets fried. This is more of a tempura batter, so it’s a delicate shell. It gets crispier and takes on a different bite. Your fried chicken is gluten-free. Is there any sacrifice in quality? No, not at all. If anything, I think the style we’re doing is actually crispier than most Korean fried chicken. It’s a custom mix of brown rice flour, white rice flour, and cornstarch. Why should Cincinnati be excited about the upcoming food hall project? Coming to a place that has affordable food that’s chef-driven. Where you can get Korean fried chicken, then come back another day for stuffed French toast. To be able to have all of that—very ingredient-driven—but at an affordable price, I think people will be very excited about that.